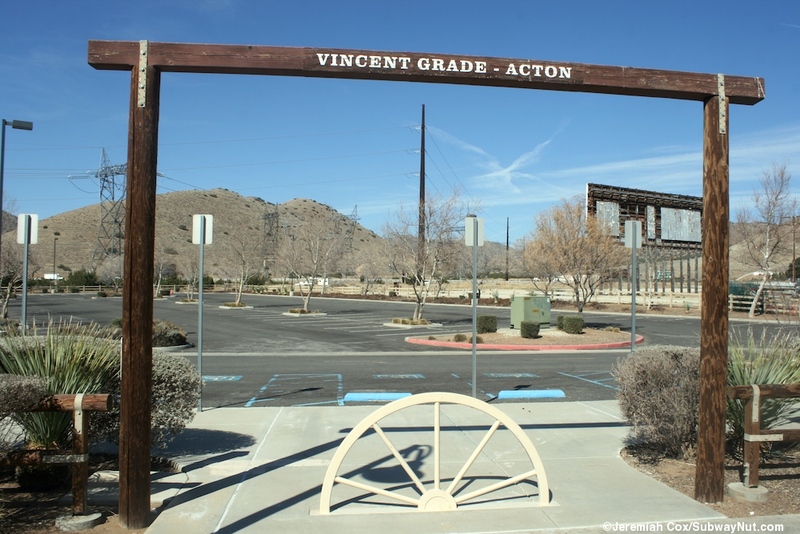 Vincent Grade-Acton's platform has shelters designed to look like an old western town that in reality look totally hokey. 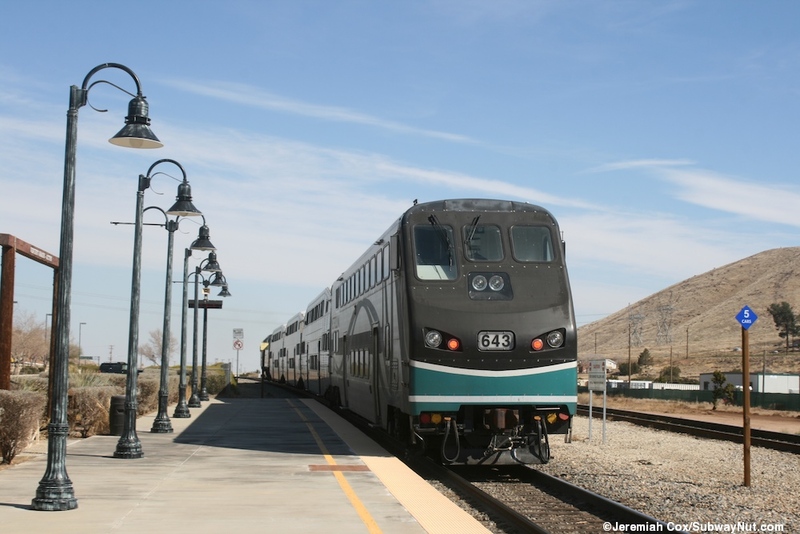 This makes slight sense since it is the one intermediate stop in the sparsely populated Soledad Canyon that the Antelope Valley Line follows the Santa Clara River through to get from Santa Clarita (in its own Santa Clarita Valley) to the Antelope Valley (in Palmdale and Lancaster). The design (intentionally fake) is a tribute to the fact this valley has been heavily used by Hollywood for filming westerns. 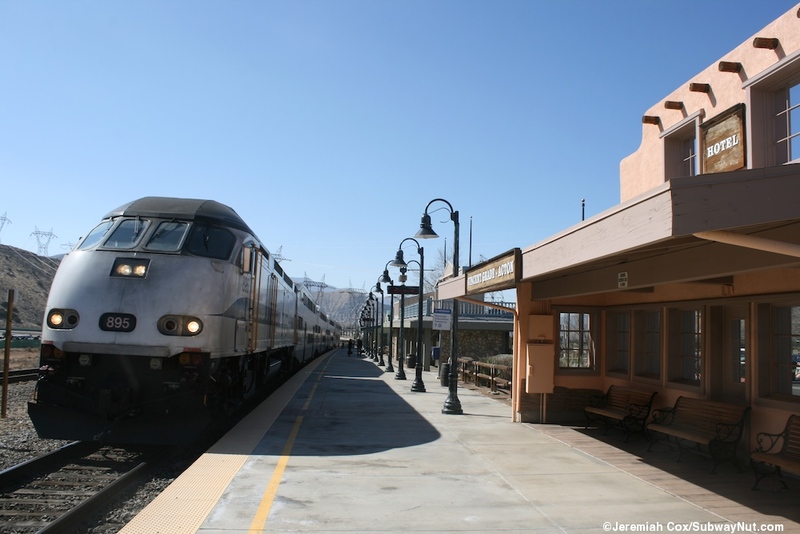 The stop is a 34 minute ride from the previous Via Princessa. 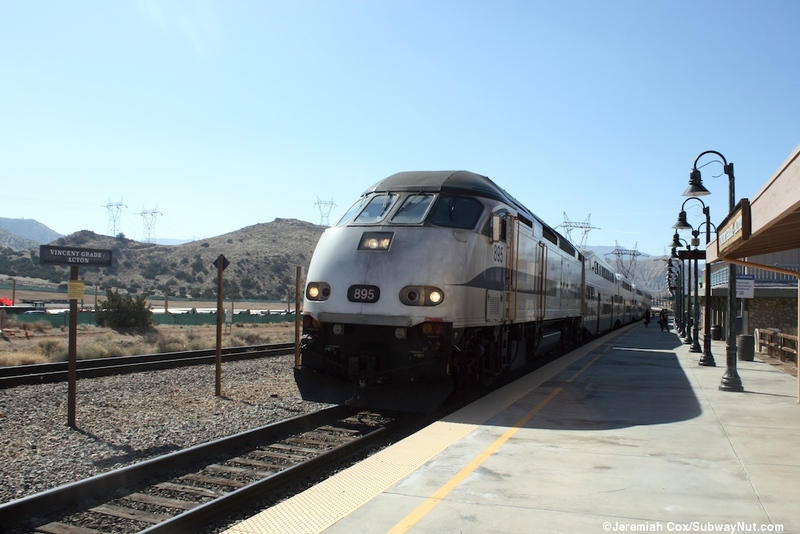 This ride is rural and scenic and feels like a ride more suited for Amtrak than a Commuter Train. Cell service (at least AT&T) is lost for a very good portion of the time. 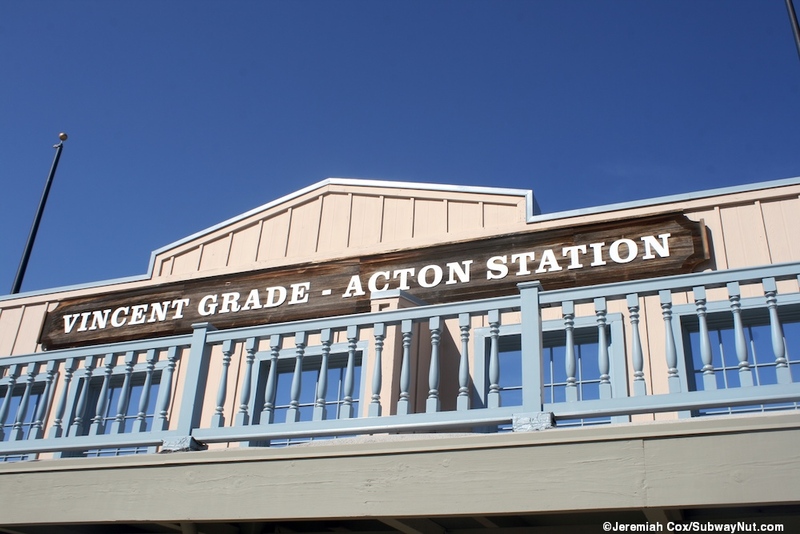 The stop is located in a census designated place of Acton, with 7,596 residents in an unincorporated part of Los Angeles County. 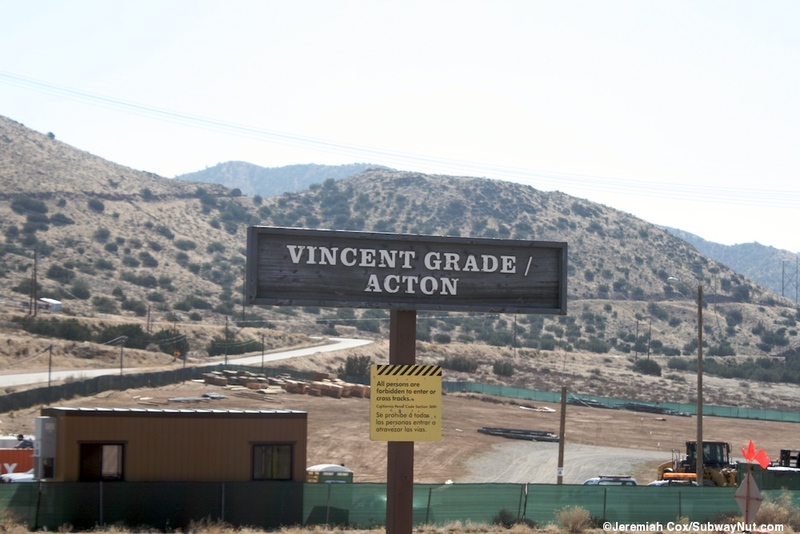 Vincent Grade is the name of the pass trains use to rise up out of the canyon and into the Antelope Valley. It is in the area of the station. 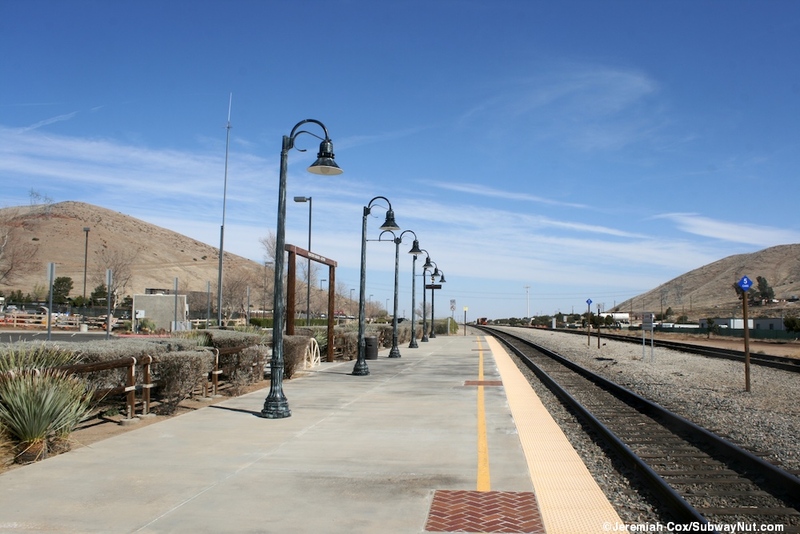 There is a minimal town around the station with very few services (no hotels, not a place to get stranded in). 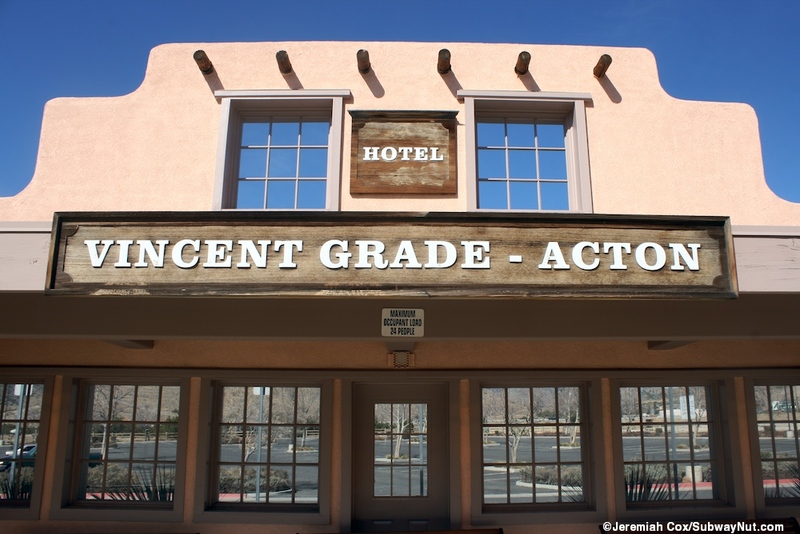 The only place I found was the Vincent Hill Station Restaurant and Saloon. 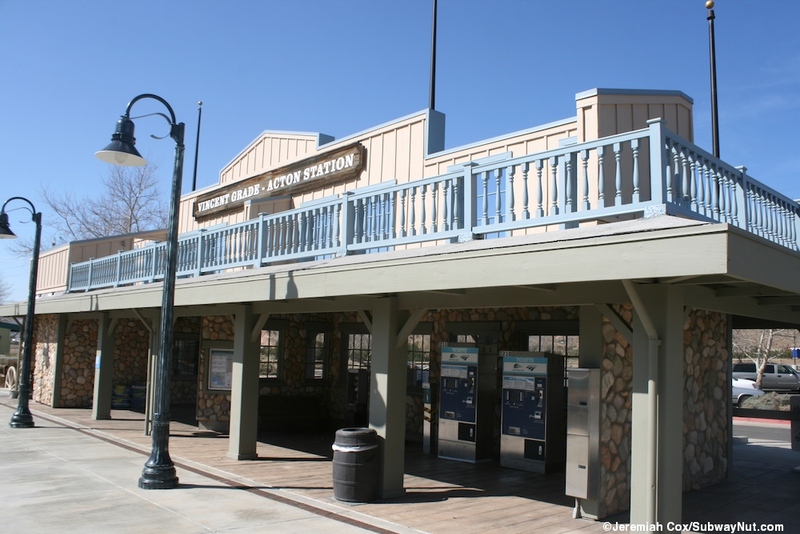 The station was built extremely quickly after the Northridge Earthquake and opened on January 31, 1994. I assume the hokey shelters were added sometime later and not expedited before the station opening 14 days after the earthquake. 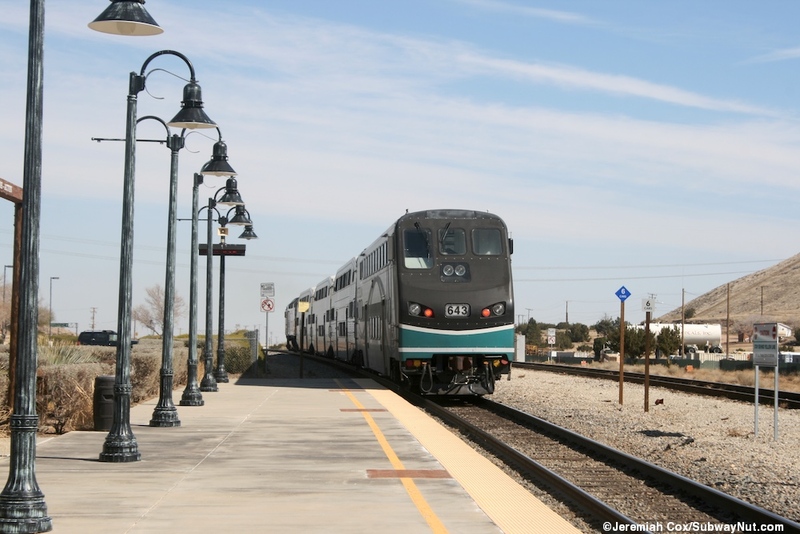 The single platform is along two tracks, the second passing the station without stopping and the designated meeting location at 6:25 every evening for train #222, the final inbound train of the day passes outbound train #215, stopping. 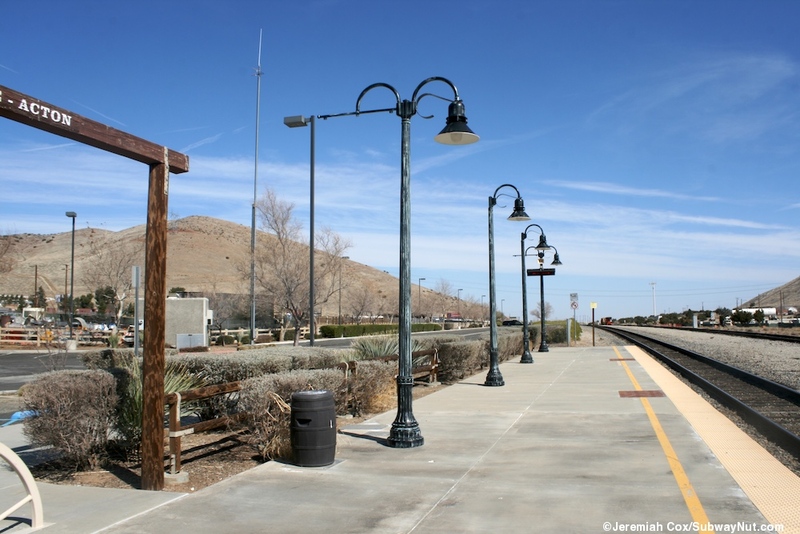 The single platform has a tactile warning strip, a line of lampposts that are black but partially colored in green (almost a fungus) designed to make them look old, and a wooden fence that divides the platform from the parking lot it is alongside. All signage (including those across from the platform along the two tracks through the station is all caps in a Serif font on wood (or fake wood), the grain clearly visible. The stations trash cans don't look normal, there designed as barrels. 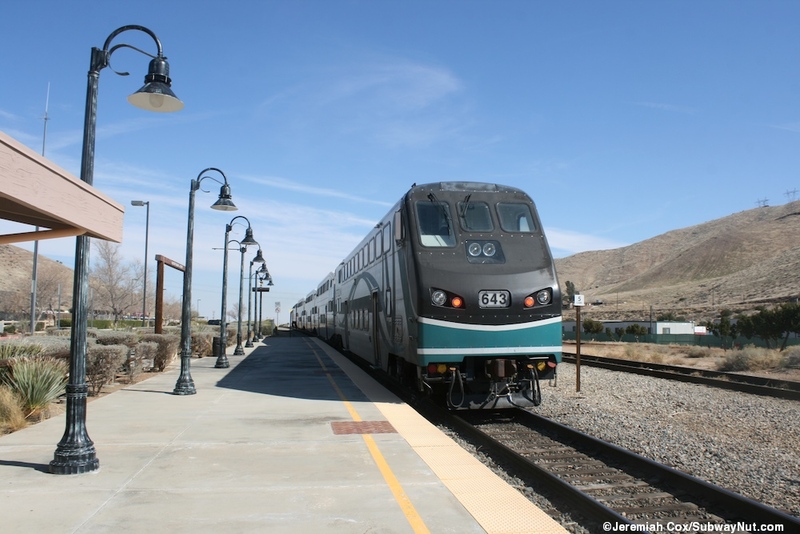 The tour of the platform will start at its southern, inbound end. First is a entrance with a wooden frame and metal wagon wheel designed to look have sunken into the concrete sidewalk. This is followed by a line of sunken wagon wheels before the first waiting structure is reached, the Store. This is a small structure with yellow-green walls and a green roof. 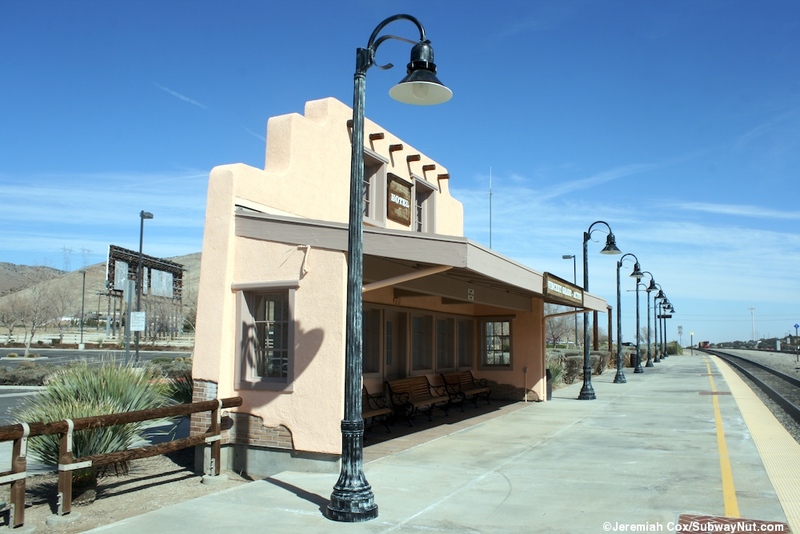 There are windows and a wall in the middle of it with a faux door, benches are on either side, some facing the platform and some the passenger pick up/drop-off area. 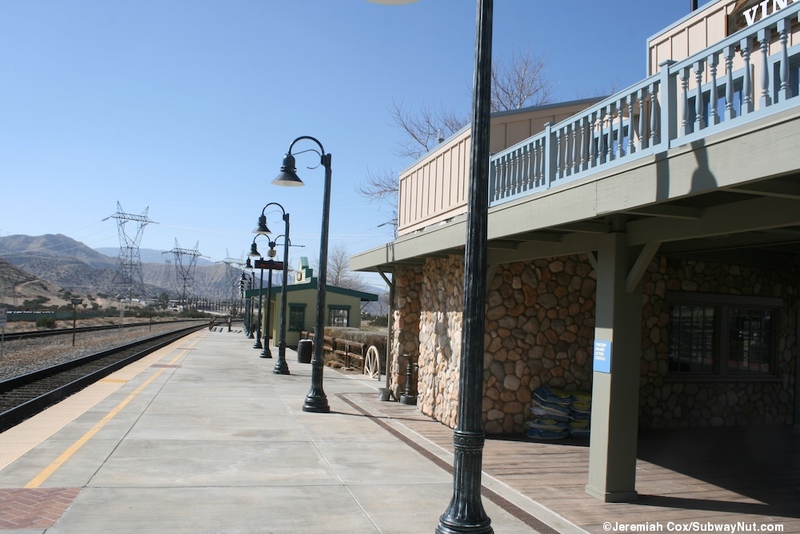 The next structure along the platform is the central, main one. This is unnamed but has stone walls with windows (compete with glass) holding up a roof that has an ornate railing on it like a balcony (but there is no way to get up there), the wall extends up to the balcony and there are a few more windows up there. The balcony is blue, the main supports not made of stone area a light green and the second useless story is cream. 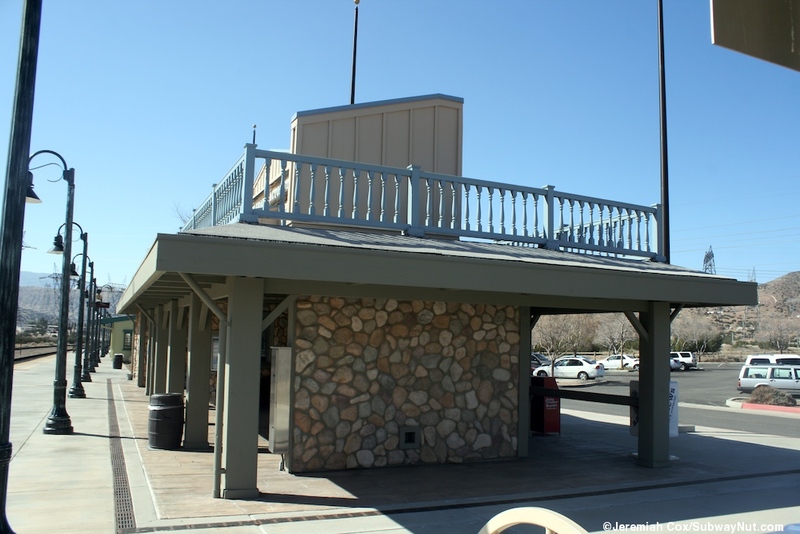 The southern end of this structure is actually enclosed, a small office for a security guard or station host (with a no public restrooms sign). 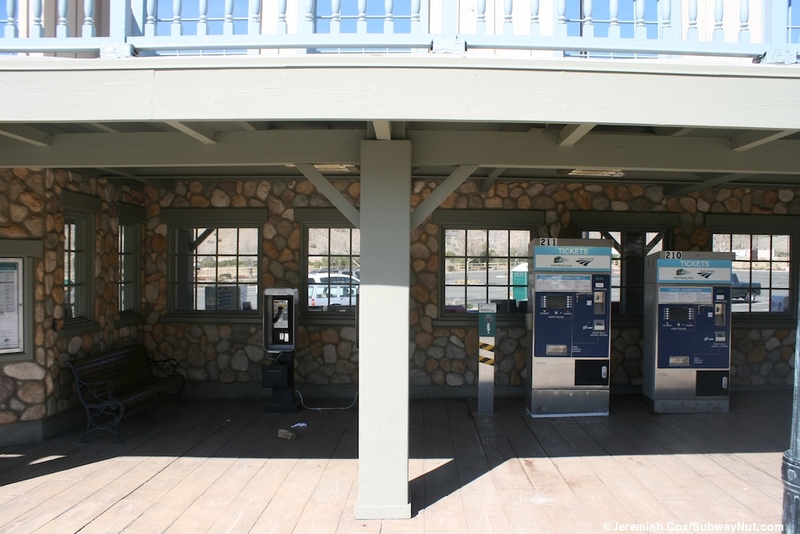 Within the main portion of this structure that faces the platform are the stations two TVMs, payphone and some benches. There are a line of newspaper boxes facing the platform. Towards the northern end of the platform is the hotel. 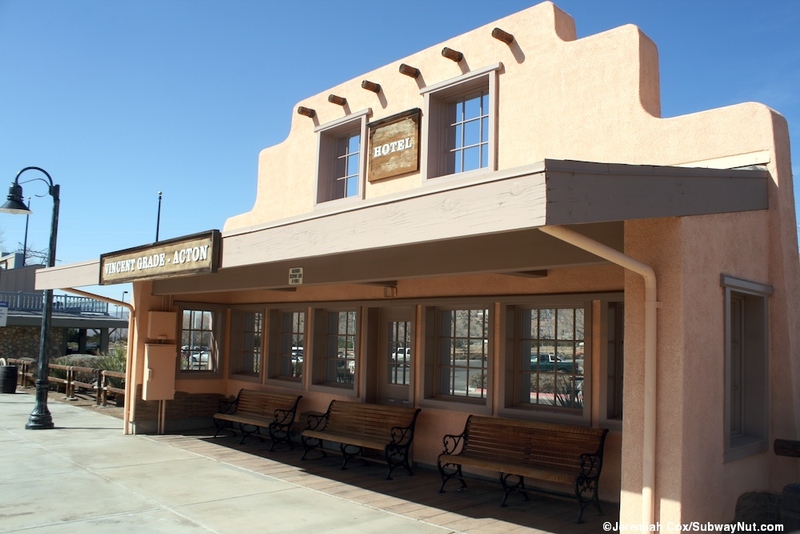 It is a pink adobe style shelter with wooden beams above the second two of windows above the roof (that looks like wood) that extends only on the platform side. 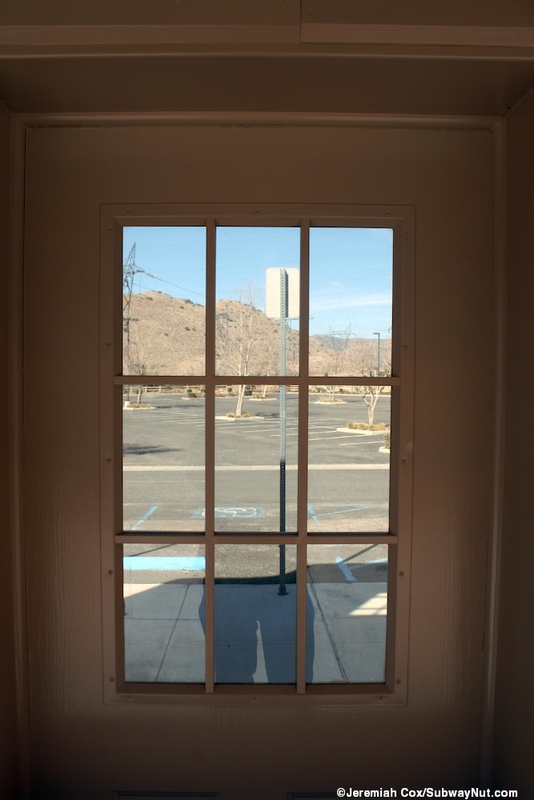 The lower portion of this shelter that only provides for the actual platform has eight windows and a fake door that is behind one of the three benches. The northern end of the platform concludes with another wooden frame entrance and half-axel down below it. 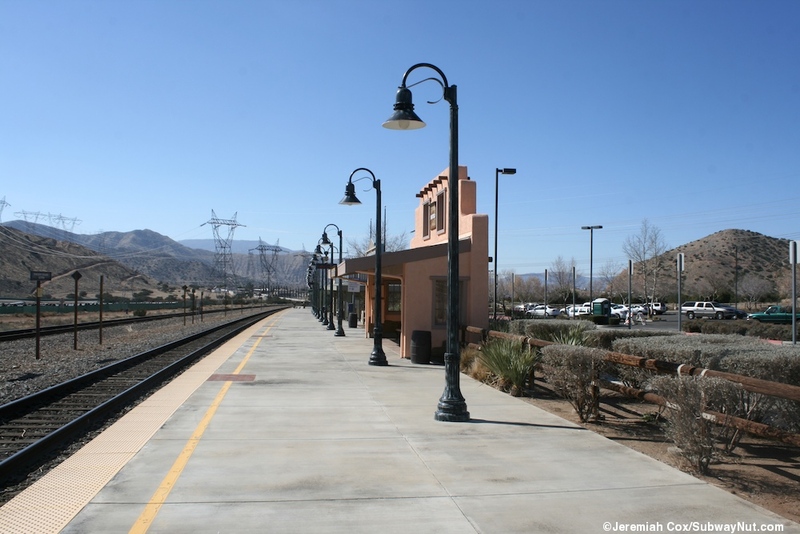 The station is on the edge of a 414 space parking lot, it has one access road that sweeps south of the station before turning and reaching the Sierra Highway at its own traffic light (the road is labeled Metrolink Station at the light). There is a final wooden entrance sign (held up by wooden posts) here as well. 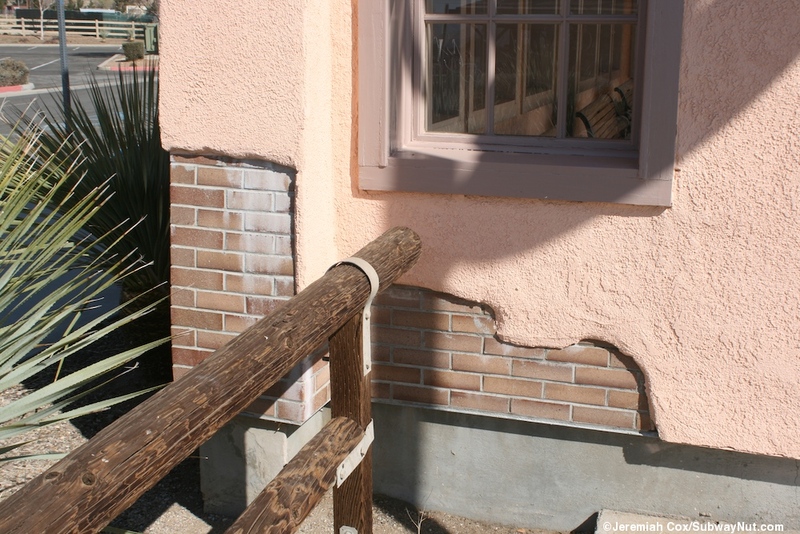 The walls of the hotel are built over bricks? I think this is part of the homage to Hollywood sets perhaps?